Dr. Ghazwan Hassna is an Assistant Professor of Information Systems at the College of Business of Hawaii Pacific University. Before joining this position, Dr. Hassna, was conducting his research at both EPIC LAB (Enterprise Process Innovation and Computing) and GCIF Lab (Global Center for Internet Finance) at City University of Hong Kong where he obtained his PhD. Before doing his PhD, Dr. Hassna had more than 10 years of experience in formulating, planning and managing IT-Enabled Change Initiatives. Dr. Hassna worked in different geographies and for/With different organizations including Dubai the Model Center, Prime Ministry of Syria, United Nations Development Program (UNDP), European Commission, Syrian Enterprise Business Center (SEBC), and the Arabic Center for the Studies of Arid Zones and Drylands (ACSAD) to name few. Dr. Hassna participated as a jury panel member for the 2016 cycle of Hamdan Bin Mohamed Award for Smart Government in Dubai, UAE. 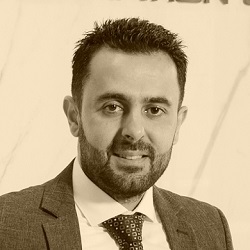 Before that, he participated in formulating the e-Government Strategy for Syria and was the monitoring and evaluation manager for the e-Government Executive Team responsible for establishing and managing the national e-Government Monitoring & Evaluation Unit (Framework – Organization Structure – Required Systems). Before that, he worked as the Executive Director and Founder of the ISRAR Initiative at the Prime Ministry of Syria within the European Commission Program for Simplifying Business Environment BESP. Dr. Hassna multinational and cosmopolitan approach has been developed and polished through extensive contact with international organizations and personnel, and through overseas education & work in multiple countries including United States of America, Hong Kong SAR, United Kingdom, United Arab Emirates, Dublin, Malta, Bahrain, Netherlands, Serbia, Egypt, Syria, Lebanon, and Oman.